It wasn’t so long ago that mobile customers were happy with their operator’s service as long as they could get a voice connection and they could actually hear and understand the person they were talking to. How times have changed. These days, customers are more discerning and have come to demand a lot more. With the rise of better quality sound for handsets, subscribers have come to expect Hi-Fi-standard connections. They also want fewer dropped calls and a reduction in silent calls. Operators have made great progress in delivering a better quality of service, but to go further to meet ever-higher expectations is more difficult. Squeezing more quality out of mature networks is not always straightforward. Instead, a new approach is needed, one that takes account of how phone users actually behave. What network problems cause customers to react a certain way and how does this affect their experience? A call broken off because of poor voice quality, or a silent line lasting several seconds, could actually be classed as successful according to traditional assessments, as long as everything was OK with the radio cell involved. Yet, as we customers know, this sort of experience is anything but satisfactory. Such failures can only be found by analyzing both user behavior (“call broken off”) and network behavior (“high bit error rate”). A project conducted by Nokia for Vodafone in Germany aimed to work out new connections between the quality measured and how it was experienced by customers. The “Voice Experience Optimization” (VEO) project focused on Greater Würzburg in the Vodafone network, where around a quarter of a million customers are served by 4,000 mobile radio cells. In addition to poor speech quality and dropped calls, the project looked at five other important factors that affect quality for customers: an unsuccessful call setup; a call partner not being reached (paging failure); a perceived dropped call; a mute call; and echo or noise. Working with Vodafone, Nokia experts identified 25 ways to improve the network. For example, Automatic Neighbor Recognition (ANR) allows users to be transferred from one mobile radio cell to the next automatically. Optimization of the ANR helps reduce call interruption rates by around 15%. The results were pretty significant – 57% of customers noticed some improvement, with 25% saying there had been a strong improvement. At the end of the project, there were 7% fewer calls that did not reach their destination and users rated speech quality as excellent. 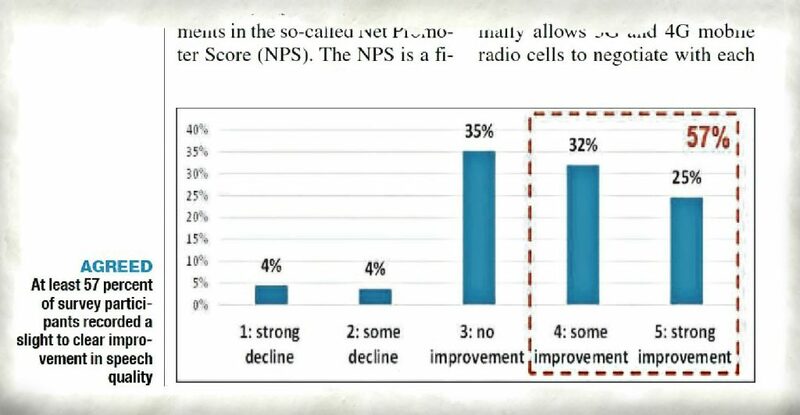 Other results included 15% fewer failures in call set-up and 13% fewer calls with poor speech quality. It just goes to show that listening to customers is clearly the route to a quality voice service. Looking for more on Network Planning and Optimization? You can sign up for the latest news and updates here.